This was a super easy and very elegant side dish that would look beautiful on any thanksgiving table. I used my Instant Pot to quickly steam the Kale without making a boiled mess. While it was cooking, I made the brown butter reduction. The whole thing came together in 10 minutes. If you have a very large family, I would suggest doubling this recipe and doing this in 2 batches, especially if you have a smaller Instant Pot. If you do not have a pressure cooker, you could use a large stock pot with a lid to saute/steam the kale. The carrots will need to be cooked separately since they take longer to cook. The total cook time will take longer. 1 bag of washed and stemmed kale or 8 cups of chopped kale, leaves removed from stems. Put the kale, carrots, broth and salt in Instant Pot. Close the vent. Set timer for 5 minutes. When the timer goes off, release the steam from the vent valve. I use a chopstick or skewer to keep my hand away from the steam. While the kale is cooking, add butter to a cold flat saute’ pan. Turn heat to medium. After the butter melts, watch closely for browning. As it turns a deep golden brown and begins to bubble, turn heat to low and add vinegar. Stir continuously until combined. 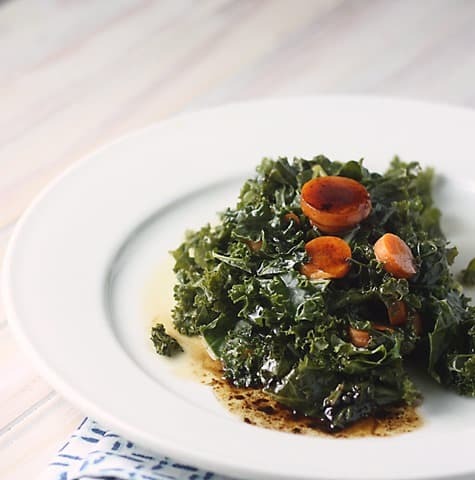 Drizzle brown butter reduction over kale. Toss gently. Serve.